Every woman is conscious about her hairstyle. This is especially true when the occasion is so important as her wedding day! Hundreds (if not thousands) of pictures will be taken of you and your wedding hairstyle will be one of the main conversation starters on this day, together with your wedding dress and makeup, of course. We know you must be aware of the most common wedding hair mistakes (like dying your hair just a few days before the big day or trying a new hairstyle), so we won’t bother you with these. What we will focus on are some less obvious wedding hair mistakes that, if avoided, can save both your bridal hairstyle and your overall wedding look! Beauty is always connected with balance. Just like you won’t look your best if you put on every shade of your eyeshadow palette on your eyelids at the same time, using too many (or too big) hair accessories can ruin your bridal hair look. Take your time and choose your hair accessories wisely. Have in mind details like your hairstyle (of course), your wedding veil, your overall look, etc. A lot of future brides make this mistake. There are just a few more days till the big day, you feel like you are running out of time, so you take out the heavy artillery and start a series of deep conditioning treatments, hoping they will compensate for the lack of hair treatment in the previous months. Over-treating your hair will inevitably make your hair too soft to work with. This will make it really difficult for your hairstylist to fix your bridal hairstyle and it will eventually get ruined sooner than expected. Many brides want their hair to be as long as possible for their wedding day. And this is totally understandable! What you don’t realize, though, is that if you don’t regularly cut or, at least, trim your hair, the split ends you will end up with on your wedding day will be far from the impeccable princess look you have been dreaming of. A small trim every 12 weeks will both help your hair grow and prevent the ends from splitting. Yes, your hairdo will have to last about 12 hours. Yes, there will be a lot of dancing, toasting, posing, crying, etc. All this, however, should not tempt you to over-spray your hair! Use a reasonable amount of high-quality hair spray or you risk your hair to start looking like a helmet… A good advice is to test the hair spray that will be used on your wedding day, so you can get the hang of the perfect balance that will both keep your bridal hairstyle in place and still look natural on your hair. Just like your makeup, your hairstyle needs regular touch-ups to look its best throughout the wedding day. If your hairdresser is not available for touch-ups on location, ask a friend or a family member to help you with this task. 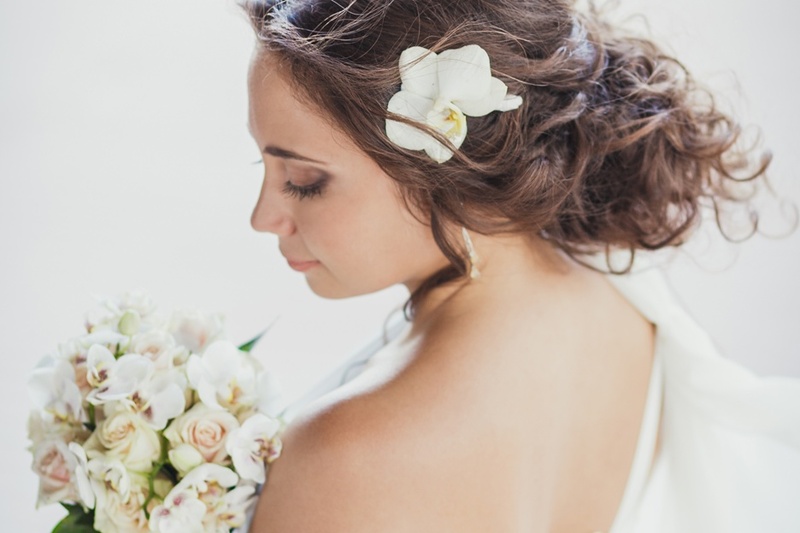 A hair spray, a few bobby pins, and a hair touch-up comb can save your wedding day hair look.